On the 28th August 2013 I constructed a projection of a 4 dimensional shape I have been contemplating for the last few weeks. It has turned out to be far more important and beautiful than I expected. – Please leave a comment at the bottom of the post to get some dialogue happening here ! The cuboctahedron can also be formed by truncating (chopping off the corners) of either the cube or the octahedron halfway along their edges, or by combining the cube and octahedron together and joining their vertexes. Buckminster Fuller also popularized a version of the cuboctahedron with flexible joins that he called the Jitterbug. 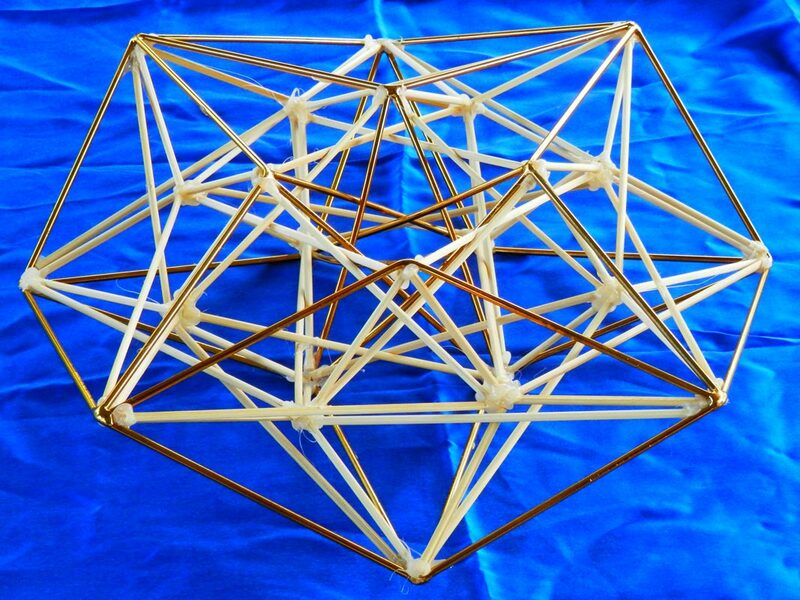 It clearly shows the way the symmetries can be collapsed into the Octahedron. 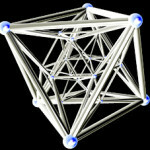 The ’24 cell‘ is a remarkable 4 dimensional regular convex polytope that has fascinated geometers for over a century. In 3 dimensions there are 5 regular convex polyhedra known as the Platonic Solids. 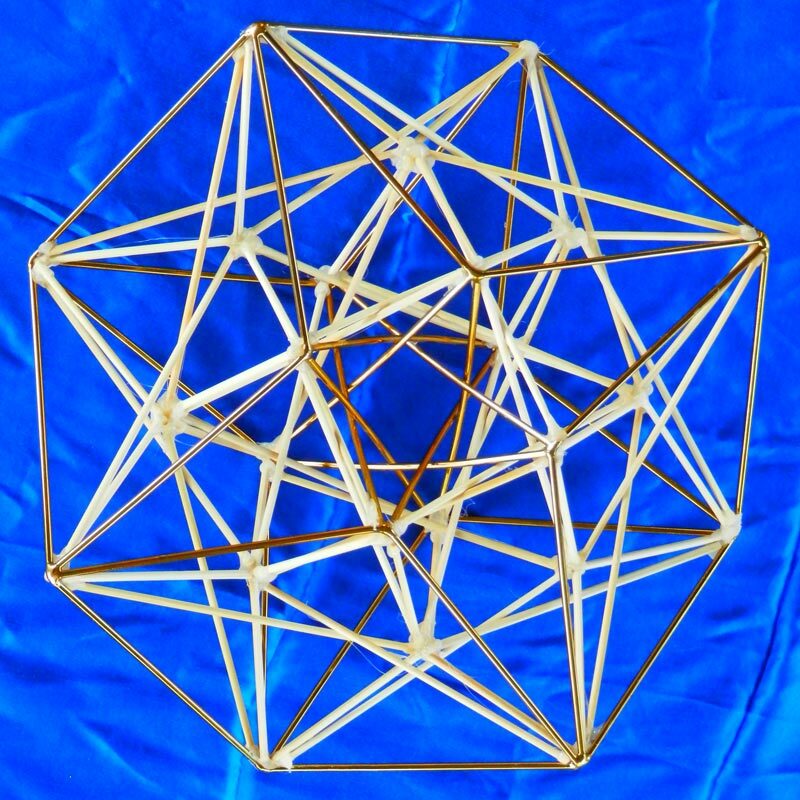 In all higher dimensions other than the fourth dimension we lost the two pentagonal forms and have only 3 convex polytopes that relate to the tetrahedron, the cube, and the octahedron. These are known respectively as the simplex, the measure, and the cross polytopes. However, uniquely, in four dimensional space there are 6 ‘Platonics’. 5 of them are analogous to the 3 dimensional Platonic Solids, and the 6th one combines the cubic and octahedral symmetries. The figure on the right is a projection of the 24 cell with one of its octahedrons apparently encompassing the whole figure. Whilst this makes its octahedral nature obvious, I prefer toroidal projections that maintain the symmetry as much as possible. The sixth four dimensional ‘Platonic Solid’ known as the 24 cell IS the 4 dimensional vector equilibrium. (For basic information about the 6 regular convex polytopes I suggest starting here http://en.wikipedia.org/wiki/Convex_regular_4-polytope. As far as I know this has not been noted before as googling the term “4 dimensional vector equilibrium” at this time brings up no relevant results other than this page here. I have found one reference on Wolfram Mathworld that shows they are aware of the facts. The figure on the right is the most accurate diagram I have seen of this projection. Every point is connected to 8 other points. The 24 cell is so named because it is bounded by 24 Octahedrons meeting at 24 points, 96 edges. The 24 points also form 96 equilateral triangular faces each of which is shared by 2 Octahedrons. 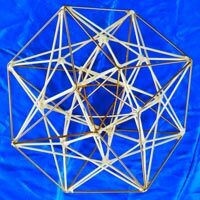 When the vertices of the 24 cell are linked to the centre of the 4 dimensional figure the triangles form 96 tetrahedrons. Although the 24 cells boundary is composed only of Octahedrons, internally the edges cell also form 12 cubes, 12 rhombic dodecahedrons, 3 hypercubes, and 12 cuboctahedra – but I am by no means finished counting all the incidental forms! Most likely the points of the dual of the hypercube known as the 16 cell are also present but not connected by edges. To make these forms visible in 2 dimensional projection the 24 points can be arranged in 3 circles of 8 points with the central circle out of phase with the outer and inner circle. In 3 dimensional projection the central and outer circles should be separated into 2 circles of 4 points lifted above and below the plane of the 2 dimensional projection. As the 24 cell is one of the 6 regular convex 4 dimensional solids, all 24 points are of course by definition equally distant from the centre of the 4 dimensional figure, and therefore all arranged on the hypersurface of a hypersphere of the same radius. The 24 cell can be constructed from the hypercube (also known as the 8 cell or tesseract) by joining the centres of its adjacent squares. To be the 4 dimensional vector equilibrium the lengths of the edges of the 24 cell must be the same as the distance of the vertexes from the centre of the 4d form. The proof that this is so can be done using only the Pythagorean theorem as follows. First we calculate the distance of the vertexes of a hypercube from the centre of the hypercube. The easiest way to do this is by creating a table showing the progression of distances as we climb up through the dimensions from the line, to the square, to the cube, to the hypercube. Using this table we see that the vertexes of the hypercube are exactly the same distance from their connected neighbors as they are from the centre of the hypercube. For convenience we have called this two units so as to make the calculations as simple as possible. Using the Pythagorean theorem the distance between centre points of the square faces of the hypercube can be easily calculated to be root 2. Therefore when the cubes of the hypercube are converted to their dual octahedra by connecting their square centres, every edge length of the equilateral triangles will be root2 and the vertexes of the triangles will be root2 units from the centre of the 4 dimensional form. Still curious about the Vector Equilibrium and the 24 Cell ?